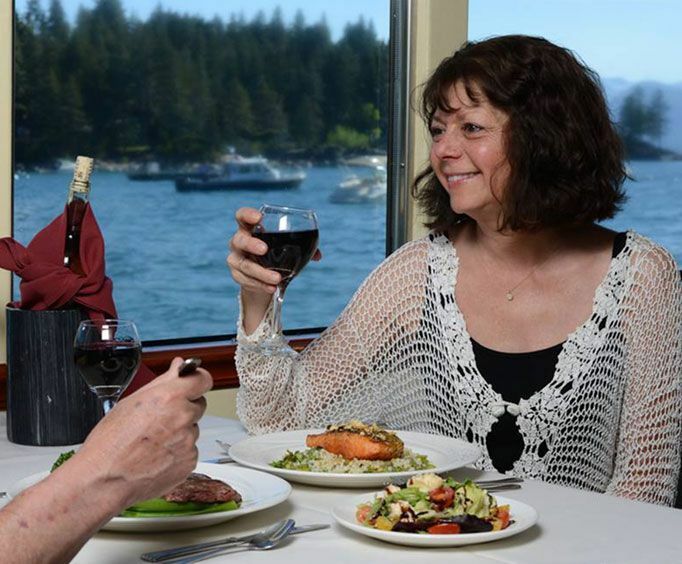 The dinner cruise price also includes dinner. The sightseeing cruise has lunch available for purchase. Cruise the crystal clear waters of one of the most photographed places on earth, Emerald Bay, Lake Tahoe, while aboard the elegant MS Dixie II. 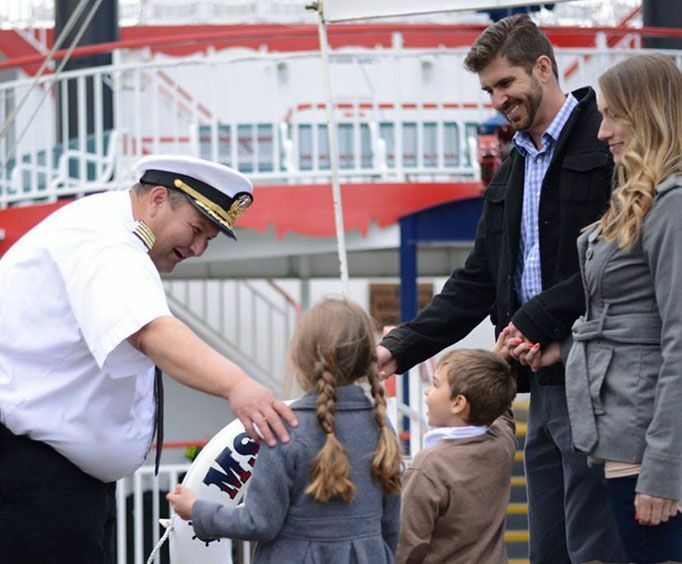 Choose from a daytime, scenic cruise or an enchanting dinner cruise to Emerald Bay aboard the majestic M.S. Dixie II. Snap nonstop photos of the gorgeous mountain backdrop during the daytime cruise where you'll learn how the Emerald Bay glacial carved granite surfaces came to be, along with its fascinating history and a special video presentation. The dinner cruise makes for the perfect evening beneath a sea of stars. Dine on a five-star, gourmet meal while enjoying live music and hearing intriguing stories about the sites of the area as you float by. You'll see Fanette Island, the home of Lora Joesphine Knight's granite Tea House and Vikingsholm Castle, a 38-room mansion built by Knight in 1929. 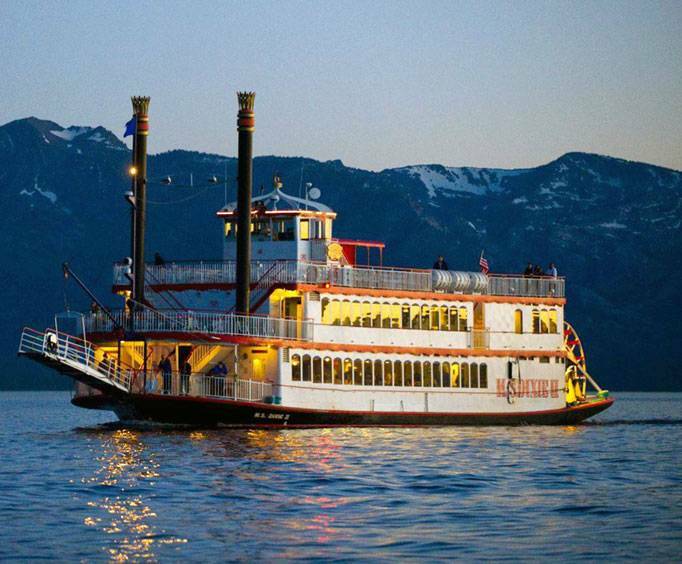 Hop aboard this gorgeous paddle wheel boat to sightsee from two spacious decks as these stately cruises take you on a calming journey across the clear, tranquil waters of Lake Tahoe to the breathtaking Emerald Bay area and back. The award-winning M.S. Dixie II has been voted 'Best Cruise in Nevada' by Nevada Magazine. A local favorite, the 520-passenger ship is indeed a local favorite and holds the title of the largest cruising vessel in South Lake Tahoe. Complimentary shuttle pick-up and drop-off service is provided and the M.S. Dixie II is equipped with a handicap-accessible restroom. Peacefully resting in the southwest corner of Lake Tahoe is the beautiful Emerald Bay. A National Natural Landmark since 1969, the bay is just 12 miles from the city of Lake Tahoe and is a popular spot for tourists. Hike or walk the scenic lakeside trails up to Vikingsholm, Mrs. Lora Josephine Knight's Scandinavian mansion built in 1929, spend a day at the beach swimming, scuba diving and paddle boarding or simply admire the immense beauty of the clear waters, steep mountain tops and glacier-carved granite. Guests can also see the remains of Mrs. Knight's Tea House on Lake Tahoe's only island, Fannette Island. **Due to construction near Cave Rock, guests should plan accordingly to ensure they reach their cruise on time. On this two-hour narrated boat cruise through Emerald Bay, you'll learn how the bay was formed and some of its fascinating history. Lunch and complete bar service are available for purchase. Sail off into the sunset for a magical evening of dinner and dancing. You'll be served a three course meal. Your entree choices include Center-Cut Certified Angus Beef New York Steak, Seared Blackened Salmon, Grilled Lemon Herb Chicken Breast, or Spinach and Roasted Garlic Ravioli. Cocktails and wines are available for purchase. "A 10 out of 10 experience!" Sailing on the m.S. Dixie ii was the highlight of our vacation! The staff was great, outstanding food and some of the best scenery i have ever seen. A 10 out of 10 experience! "made you feel right at home"
"I recommend this cruise for couples and family dinner"
This is our third time on this boat , 4 years ago we had our wedding reception on this boat and it was amazing! I recommend this cruise for couples and family dinner the staff is extremely friendly. Our waiter kevin was excellent this trip... I order tickets online and had no problems at will call great service. I will be back next year for our 5 year anniversary. Tip: Must have the rum runner drink delicious ???? "high point of our trip"
I expected this to be a very good event, but it became a high point of our trip. Not to take away from the beautiful beaches or the great sights but this cruise had everything. Lots of people but all moved on board quickly. We sat with a group of 4 and had great conversations. The food was very good, the wine inexpensive and the servers very attentive. The sights were spectacular and it was all rounded out with a dance band in a large lounge playing popular music. Tip: Don't be disappointed. To be sure you get on board buy your tickets in advance from vacations made easy.